The device at right — the “Plant Lock,” for locking bikes, not plants — was new to me. It’s one of a number of features employed in a so-called “DIY Street” in the East End of London. Getting cars cars to slow down instead of racing through backstreet rat runs benefits everyone from cyclists to residents. But a windswept street on a November night in the East End of London is not the first place you’d expect to find inspiration for how to do that – not only cheaply but also with the total approval of the people who live there. Clapton Terrace is one of 11 “DIY Streets”, a nationwide project launched by sustainable transport charity Sustrans as a cheap solution to local traffic problems. By narrowing and raising sections of road to pavement level, planting trees and using street furniture and bollards, the scheme forces drivers to slow down by blurring the distinction between space dedicated to cars and pedestrians. Two years ago locals were fed up as drivers were using their street as a shortcut to avoid a busy junction nearby. They resurrected their residents’ group and got together to vote on their own DIY Street. Lyn Altass became what Sustrans calls a “community champion”. “We leafleted every house for ideas and 40% of people responded. Hackney council only gets 25% during elections,” she says when I meet her. She points proudly to the new trees and new access to the green opposite, which means the road now looks more like an entrance to a park. Residents described the street as previously being “an accident waiting to happen.” By raising a section of road in the centre of the road to pavement height, traffic is forced to slow down. The road now feels a lot more spacious as two trees were added beside the road, communal wheelie bins replaced 64 individual bins, and a fence around the nearby green was removed. 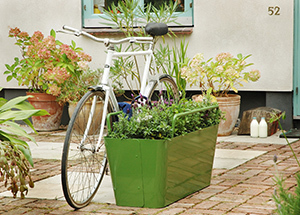 The site also uses Plantlocks – boxes of plants with bike-friendly bars – where residents can lock bikes. “We were expecting a 20mph sign and we got all of this!” a local told me. Comments Off on DIY Streets. Click here to leave a comment. Two L.A. traffic engineers who pleaded guilty to hacking into the city’s signal system and slowing traffic at key intersections as part of a labor protest have been sentenced to two years’ probation. Authorities said that Gabriel Murillo, 40, and Kartik Patel, 37, hacked into the system in 2006 despite the city’s efforts to block access during a labor action. Fearful that the strikers could wreak havoc, the city temporarily blocked all engineers from access to the computer that controls traffic signals. But authorities said Patel and Murillo found a way in and picked their targets with care — intersections they knew would cause significant backups because they were close to freeways and major destinations. The engineers programmed the signals so that red lights for several days starting Aug. 21, 2006 would be extremely long on the most congested approaches to the intersections, causing gridlock. Cars backed up at Los Angeles International Airport, at a key intersection in Studio City, at access onto the clogged Glendale Freeway and throughout the streets of Little Tokyo and the L.A. Civic Center area, sources told The Times at the time. No accidents occurred as a result. As part of their plea deal, the engineers agreed to pay $6,250 in restitution and completed 240 hours of community service. Comments Off on Traffic Hack. Click here to leave a comment. Via BoingBoing, a few parts Norman Bel Geddes, add a dash of atomic utopianism, a twist of Broadacre City, and follow with a Wall-E chaser. Rather odd to see 1950s gender-work relations projected so far out into the future. But at least we’re finally getting the real-time traffic info! Comments Off on Visionary Highway Film of the Week. Click here to leave a comment.